A block or small piece of mass with unparalleled faces, especially two of them being opposite to each other are known as wedge. The application of this wedge is particular in lifting other blocks. 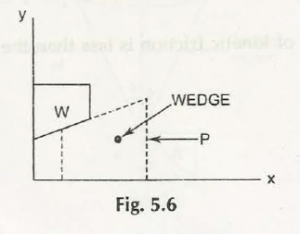 The horizontal force used by this wedge or P in the figure below is capable to lift weight of W. The power applied to uplift that block should always be greater than W, only then it will create a counter upward power to help in the uplifting. The force Pis applied to a block of mass 9 Kg, which is stationary before the force applied. Determine the magnitude and direction of the friction force F exerted by the horizontal surface on the block if (a) P = 30 N (b) P = 40 N (c) P =50 N. (Re( Fig. 5.l(a)). = mg cos α x w /2. 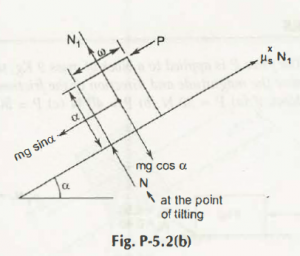 Find the least force required to drag a body of weight W, placed on a = Wrought inclined plane having inclination a to the horizontal. The force is applied to the body in such1 a way that it makes an angle θ to the inclined plane and the body is (a) on the point of motion up the plane (b) on the point of ‘motion down the plane. 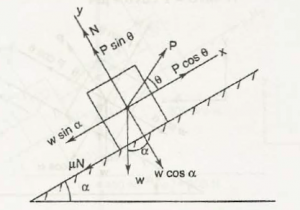 p min = W sin (α +ϕ) . Two blocks A and Bare connected by a horizontal rod and are supported on two rough planes as shown in Fig. P-5.5. if the weigh t of block B is 1500 N and coefficient of friction of block A and B are 0.25 and 0.35 respectively, find the smallest weight of block A for which equilibrium exists.